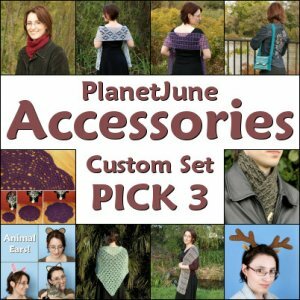 By popular demand, you can now mix-and-match to create your perfect set of three PlanetJune Accessories patterns for a very special price. This offer is not available anywhere else! Pattern details and additional photos: Please see each individual PlanetJune Accessories item listing for additional photos of each design, yarn and hook requirements, size, and other information. Please note: You may buy as many custom sets of 3 patterns as you need; just add this product to your cart as many times as you wish, selecting 3 different patterns each time.